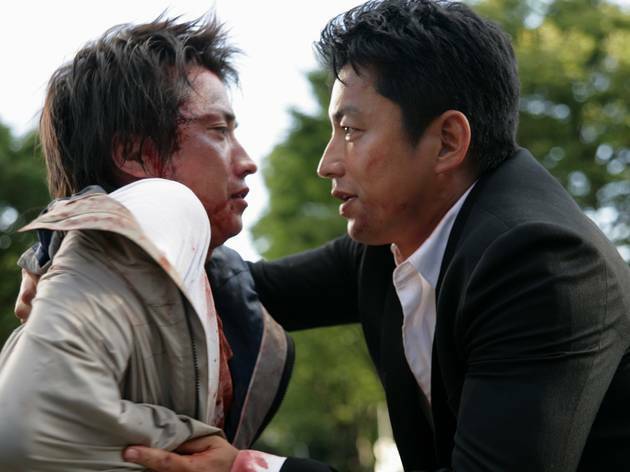 Takashi Miike's latest starts as a tense thriller, quickly becomes a tedious morality play. It's a hell of a pitch: A filthy rich elderly man takes to all of the newspapers and the internet, urging the entire Japanese populace to kill the child molester who murdered his granddaughter. The reward? One billion yen. The criminal, Kunihide Kiyomaru (Battle Royale's Tatsuya Fujiwara, still eerily babyfaced) turns himself in to the police where he thinks he'll be safest. A task force is quickly assembled to transport the prisoner to Tokyo. It's headed by Kazuki Mekari (Takao Osawa), who's still mourning the premature death of his wife at the hands of a drunk driver, and Atsuko Shiraiwa (Nanako Matsushima), a no-nonsense female detective angling for a promotion. The problem? Anyone they encounter along the way could be an assassin. Instant nail-biter, right? Unfortunately, no. Pretty much all of the action in prolific Japanese director Takashi Miike's distended Shield of Straw comes up front (the picture peaks with a vehicle-demolishing sequence in which a nitroglycerine-loaded truck plows through a police convoy). The rest of the running time is given over to mostly monotonous moralizing about vengeance, principles, and what a life—even that of a killer—is worth in the grand scheme. Miike tries to manufacture suspense by casting suspicion on the motives of every member of the task force, especially our heroes Mekari and Shiraiwa. Yet the film is too slickly formless and dully shapeless for any tension to take hold. Compared to Miike's rigorous, searching and very underrated 3-D samurai drama Hara-Kiri (2011)—itself a movie concerned with exploring codes of honor and the all-consuming lust for revenge—this is lowest-common-denominator gibberish that follows an extras-crowding, helicopter shot-abusing arc to a leaden finale. (Imagine a Sergio Leone face-off drained of all humor and apprehension, flabby as stretched taffy instead of boundlessly taut.) But there is an occasional glimpse of a deeper film, such as a scene in which the task force's oldest member (Masatô Ibu, lending some welcome gravitas) quietly comes to terms with the dark impulses of human nature, his own included, after failing to talk down a distressed would-be assassin. Otherwise, this is a real slog—the first competition film I've seen with barely anything to recommend.